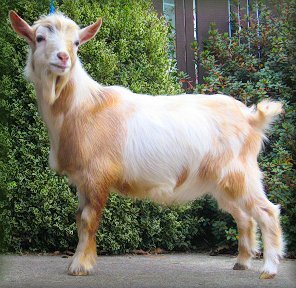 Although domestic goats in general originated in Asia, the Nigerian Dwarf is one of four types of dwarf goats from Africa. The miniature goat is an ancient breed of goat recorded as living in Sudan, Africa 5500 years ago. There are many local variations throughout Africa, but the four basic types are West African, Southern Sudanese, Somali and Small East African. Found on the coast of west and central Africa, in all colors, the West African Dwarf is trypanotolerant (resistant to disease carried by the tsetse fly). It is from these West African herds that the first dwarf goats were imported into the United States. The first legal records of West African goats which made their way to America were in the 1930's and 1940's to Benson's Animal Farm, to Consuela Vanderbilt's estate, and to the Randolph Hearst family estates in California. It is believed they may have come over even earlier on slave ships or on ships where they were used as feed for lions. Any surviving goats were kept in zoos as novelties. In time, some of the goats in zoos came into the hands of private owners. The West African goats represented a broad range of body types and colors, with some carrying genes for greater stature. The first genetic type, achondroplastic, is typical of the West African dwarf goat found in the Guinean zone of West Africa. Characterized by a large head, wide body and short limbs. It seems likely that ‘our’ Pygmy Goat is not the extreme form of achondroplastic origin, but a transitional type of more pleasing appearance. The second type, pituitary, is a slender, normally proportioned goat and was found in the Southern Sudan region. This was a true miniature and ideally would have a proportional sized head and body for its short stature – typical of today’s Nigerian Dwarf. It was in the 1960's and 1970's in the United States that a distinction was made between the African Pygmy and Nigerian Dwarf and selective breeding began to more formally develop the two types. The Pygmy Goat Club in Britain does not differentiate between the types. Upon its formation in 1982 it discarded the regional names in general use, such as Nigerian, Cameroonian, Nilotic, Sudanese, West African etc in favour of the general term of Pygmy Goat. Several closed herds of goats that originated from Africa, and were not interbred with other breeds of goats were located in different parts of the country by interested Nigerian Dwarf goat enthusiasts in the early 1980's. The first registry that recognized the Nigerian Dwarf goat as a breed separate from the Pygmy goat was the International Dairy Goat Registry (IDGR). In 1982, the first goat registered was a buck named Bullfrog Alley's Johnny Jump-up #2. The American Goat Society (AGS) registered its first Nigerian Dwarf goat in 1984, followed by the Canadian Goat Society (CGS) in 1985. The Nigerian Dwarf Goat Association (NDGA) was founded to focus solely on the Nigerian Dwarf Goat in 1997. 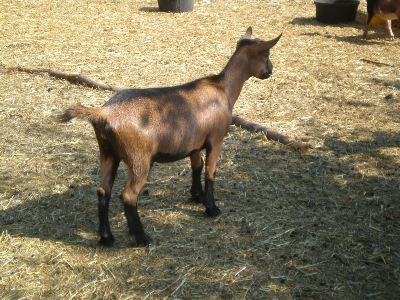 The first NDGA goat registered was Oak Meadow's Pippin's Prize. 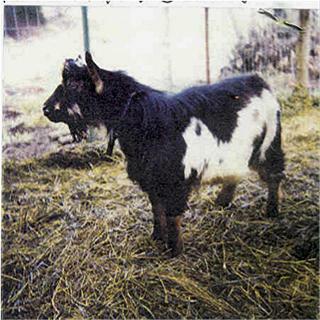 The American Dairy Goat Association accepted the Nigerian Dwarf into its registry in 2005. Like many breeds of domesticated livestock, the complete history of the Nigerian Dwarf is incomplete. Through the years and stages of development, records were not always kept, or if they were, they are sketchy at best. Developing the history of the breed is much like putting a jigsaw puzzle together that is missing many of its pieces. To reach the present day Nigerian Dwarf, one has to use a combination of documented facts, speculation, deductive reasoning and a little imagination. What is known is that throughout tropical Western Africa, there is a type of goat referred to as the West African Dwarf (WAD). These goats are used as a food source, both meat and milk, for the local population. Due to economic hardships, keeping "pets" is not an option. It appears that little thought is used in breeding and it is truly a survival of the fittest phenomenon taking place. In the writings about Albert Schweitzer and his work at his hospital in Lambrene in the country now known as Gabone, the local goat is often times referred to, and in fact is credited with supplying the milk for the hospital. The imported breeds typically known as dairy breeds weren't able to withstand the Tse-Tse fly, and therefore were not productive. The WAD goats continued to survive and thrive. Throughout books on Dr. Schweitzer, pictures of goats similar in type to what are referred to as a Nigerian Dwarves in the U.S. can be found. Exactly how the WAD goats came to American soil is one of the missing pieces in the puzzle. One theory is that as the big cats were shipped to zoos, goats were loaded on to the vessels as a food source for the cats while in transit. The goats that weren't consumed went on to the zoos. As early as 1918, Joseph Crepin reported in the second edition of la Chevre that WAD goats had been imported to the United States. Additionally, there were a number of documented importations from the 1930s to the 1960s. The beginning of the breed in this country lies in zoos. The first miniature goats to appear in this country were part of zoo exhibits, and occasionally research institutions. As the population began to grow, it became necessary to reduce the number of animals and individuals had their first opportunity to own these unique goats. Originally, all small goats of WAD origin were indiscriminately referred to as pygmies. In the beginning, "pygmy" was used more to describe a size of goat rather than a specific breed, much like "Swiss" is often times used to refer to the various erect eared breeds hailing from Europe. As time went on, breeders began to notice differences in type within what had become the Pygmy breed. It became apparent that there were two distinct types: the shorter legged, heavier bodied, round bone animals more typical of what is known today as a Pygmy, and the more refined, angular animal that has become today's Nigerian Dwarf. As breeders began to communicate, they discovered there were others in the United States and Canada that had similar observances. Mrs. Bonnie Abrahamson of North Ogden, Utah, while working in a zoo in California was one of the first to notice the distinctive difference. Mrs. Abrahamson brought several black and white animals that she referred to as "Nigerian Dwarves" to an AGS Pygmy certification committee. Despite their more refined type and dairy appearance, these animals were accepted into the AGS Pygmy herdbook. At about the same time, Mr. Heabert Woods of Alexandria, Indiana, had animals similar in type to Mrs. Abrahamson's, but brown in color, refused entry into the National Pygmy Goat Association's herdbooks because of their color. These two breeders petitioned the International Dairy Goat Registry (IDGR) to open a herdbook for Nigerian Dwarves. IDGR opened a separate herdbook for the breed, complete with a standard emphasizing dairy characteristics, and on July 24, 1981, Mr. Robert Johnson's Bullfrog Alley's Johnny Jump-Up #2, a buck bred by Mrs. Abrahamson, became the first Nigerian Dwarf registered by any registry. By January 1987, there were 384 animals registered in the herdbooks of IDGR as Nigerian Dwarves, with 93 of those registered the previous year alone. In part, largely due to the fact that IDGR does not sanction shows, the popularity of the registry has waned over the years. The early Nigerian Dwarves were seen most often in three distinct color lines, all of similar type, even though many of the early breeders attempted to keep each color line separate from the others. A majority of these early animals were brown, black or gold, all with or without random white markings. Possibly because of the limited number of representatives of the breed, breeders did begin to mix the color lines fairly early on, although references to specific color lines could still be found as late as 1988. In 1984, the American Goat Society (AGS) opened a herdbook for Nigerian Dwarves, and by September of the following year, 82 animals, representing breeders from 8 states and Canada had been registered. The first AGS registered Nigerian Dwarf distinction goes to Wrights Pansy, AGS # D-1f, owned by Francis Wright of Indiana. Mr. Woods was instrumental in getting a separate herdbook for the breed with AGS, and was made chairman of the Nigerian Dwarf committee. Mr. Wright and Pat Freeman of Dutton, Ontario completed the original Nigerian Dwarf committee for AGS. To form the foundation of the breed, applications were submitted to the committee, along with a clear photograph of the animal and a measurement of the animal at the withers. If the committee unanimously agreed that the animal, that had to be at least one year of age, met the breed standard, the animal was then eligible to be registered as a purebred Nigerian Dwarf. Animals that were accepted for registration using this process are often times referred to as a "committee animal." Some of the animals submitted, such as Mrs. Abrahamson's, were previously registered as Pygmies. It also would include animals with unknown backgrounds that showed true Nigerian Dwarf characteristics, and as time went on, animals that were of registered ancestry but which did not have the paperwork kept up. Many times, it was easier to submit the animal for certification than to retrace paperwork for several generations. 1992 we have had a closed herdbook All breeds begin somewhere, and what is more important that what we started with, is where we are going. Using the wide genetic base created through the open herdbook, breeders are now molding the breed into a superior milk-producing animal of unmistakable dairy goat type that also happens to be small. While the Nigerian Dwarf and the Pygmy share common ancestry, they have clearly become two, distinct breeds through the efforts of breeders of both of the breeds. The popularity of the breed has continued to grow, in part because of AGS sanctioned shows being held across the country. The first show that offered a separate sanction for the breed was the 1985 AGS National Show held in Graham, Texas. Only two exhibitors of Nigerian Dwarves were present (Shaula Parker and Kathleen Claps), and the breed wasn't official, but there has been no looking back since. Pine Cone Valley Black Satin, a doe that is listed as an original import, owned by Ms. Claps, had the distinction of being crowned the first AGS National Champion Nigerian Dwarf. While the popularity of shows skyrocketed after this, another AGS National Show wouldn't be held until 1996. Through the hard work of Nigerian Dwarf breeders, an AGS sanctioned National Show has been held every year since. Please see the pictures of our 5 beautiful National Show winners at the end of this section. Interestingly, the 4 does to win the national after Black Satin all trace back to her many times. From the first show in 1985 with a few animals, it is now not uncommon for a show of Nigerian Dwarves only to approach 200 animals. AGS sanctioned shows are being held in almost every part of the country, and Nigerian Dwarf breeders are traveling thousands of miles a year to promote the breed and their herds. Looking back at the breeders that have made this all happen, we need to start with Mrs. Abrahamson. It was her vision that the breed be classified separately from what was known as the Pygmy. Due to her failing health, Mrs. Abrahamson was force to sell her herd in 1981, and Robert Johnson, owner of IDGR, purchased her herd. Her Bullfrog Alley herd can be found in many of today's Nigerian Dwarves, either directly, or more commonly through Mr. Johnson's Pine Cone Valley herd. Of course, Mr. Wood, working primarily with the brown line, was quite influential, and Highland Woods animals are evident in many pedigrees. Mr. Wood worked closely with Mr. Wright of Wrights Acres, and those animals appear in many pedigrees as well. Ms.
Freeman's Braco herd, primarily through the popularity of one buck, can be found in many pedigrees. Of these early breeders, unfortunately many are no longer alive or no longer active. Ms. Freeman still breeds goats, but her herd is known more for its Pygmies. Moving a bit forward, we find three other prominent herds that have heavily influenced the Nigerian Dwarf breed. Fortunately, for ANDDA and the breed, all three are still actively breeding and are members of ANDDA. Mrs. Sandra Mason, now of Medina, Ohio, but previously from Texas and then Washington, owns the Brush Creek herd. Much of her original herd traced to the San Antonio zoo that reportedly had direct imports. Mrs. Mason has been breeding Nigerian Dwarves since 1982 and is the current AGS Nigerian Dwarf committee chairperson and current ANDDA Director-at-Large. Also beginning in 1982 was Mrs. Shaula Parker of Willow Park, Texas. Breeding under the herdname of Willows or Willow Creek, Mrs. Parker's animals can be found in pedigrees throughout the country. Additionally, Mrs. Parker was the breeder of the 1996 National Best of Breed doe. Mrs. Parker and Mrs. Mason have formed a very close relationship, and animals from each herd can be found in the other. Also, these two ladies co-edited the first breed publication, Footnotes*. The last herd to be mentioned is that of Ms. Kathleen Claps, now of Dripping Springs, Texas. Her Goodwood animals have stamped a very distinctive type across the breed. The achievement of the Goodwood animals is nothing less than remarkable. The first Master Champions wear the Goodwood name, the 1997 National Best of Breed doe was a Goodwood doe, the first animals on test were owned by Goodwood. Ms. Claps was also the founder of one of the original breed organizations for the breed, and following the decision to stop publishing Footnotes*, Ms. Claps began the breed magazine, Ruminations, remaining its editor until recently. These three ladies have done more than most of us will ever know in the formation of the breed to what it has become today. But, not to rest on our laurels, the breed can be equally proud of our "new" breeders. We now boast a breeder of multiple ADGA National Show champions, previous owners of large commercial dairy goat operations, and a past ADGA President. Of course, we also have the beginner that has never owned a goat before and the enthusiasm that brings, and breeders of every currently recognized ADGA breed. Through this varied mix of individuals, the breed's future is secure. The Angora goat originated in the district of Angora (present day Ankara, the capital of Turkey) in Anatolia. The Angora dates back prior to early biblical history. Mohair became a valuable product in commerce early in the nineteenth century. In order to increase the supply of mohair available for export to the European countries, the Turks crossed the Angora goat with common stock to increase the poundage of salable hair. Probably there was no effort to keep the original Angora separate, and the general increase in size and vigor of the goats in the Angora area was, no doubt, partially the result of this infusion of other blood. The Angora is very picturesque animal in which both sexes are horned. The bucks usually have a pronounced spiral to the horn, which comes back and away from the head; the horns of mature bucks sometimes reach two or more feet in length. In contrast, the horn of the female is comparatively short, much smaller, and has only a very slight tendency to spiral. The horn of the female seldom exceeds nine or ten inches. The ears are heavy and drooping. The most valuable characteristic of the Angora as compared to other goats is the value of the mohair that is clipped. The mohair is very similar to wool in chemical composition but differs from wool in that it is has a much smoother surface and very thin, smooth scale. Consequently, mohair lacks the felting properties of wool. It is a strong fiber that is elastic, has considerable luster, and takes dye very well. Angora stock was distributed to different countries, and Charles V imported a pair of Angoras to Europe about 1554. In 1765 the Spanish government made an importation and twenty years later a considerable number were imported into France. None of these importations were successful in establishing mohair production. On the other hand, Angoras were taken to South Africa in 1838, and from this importation and later importations mohair production was established in that country. The top mohair producers in the world are Turkey, U.S.A. and South Africa. The Angora goat (Turkish: Ankara keçisi) is a goat from the Angora region in Asia Minor, near present-day Ankara, Turkey. It is first mentioned in the time of Moses, roughly 1500 B.C. The first Angora goats were brought to Europe by Charles V, Holy Roman Emperor, about 1554, but, like later imports, were not very successful. The fleece taken from an Angora goat is called mohair. A single goat produces between five and eight kilograms of hair per year. Goat shearing is done twice a year, in contrast to that of sheep which are shorn only once. Angora goats are more susceptible to external parasites (ectoparasites) than similar animals, because of the density of their fiber. They are not prolific breeders, nor are they considered very hardy, being particularly delicate during the first few days of life. Further, Angoras have high nutritional requirements due to their rapid hair growth. A poor quality diet will curtail mohair development. For a long period of time, Angora goats were bred for their white coat. 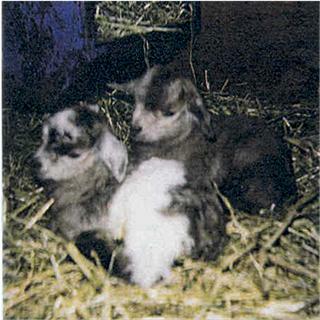 In 1998 the Colored Angora Goat Breeders Association was set up to promote breeding of colored Angoras. 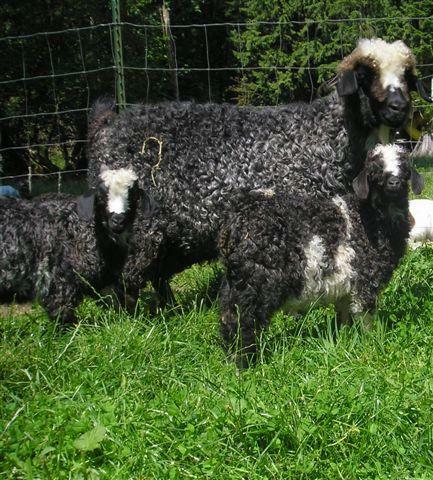 Now Angora goats produce white, black (deep black to greys and silver), red (the color fades significantly as the goat gets older), and brownish fiber. Today the United States, Turkey, and South Africa are the top three producers of mohair. The Pygora Goat is a cross between the Pygmy Goat and the Angora Goat that produces three distinct kinds of fleece and has the smaller size of the Pygmy. The Pygora was a purposeful cross, bred by Katharine Jorgensen of Oregon City, Oregon. In 1987, the Pygora Breeders Association was formed in the United States and has since then been registering and promoting Pygoras. 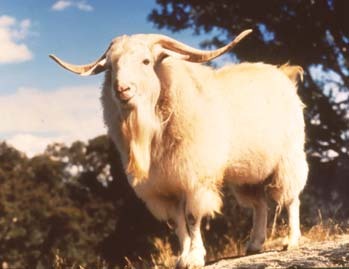 Today the registered Pygora Goat may not be more than 75% AAGBA-registered Angora Goat or 75% NPGA-registered Pygmy Goat. Pygoras live from 12-14 years and are commonly used as pets along with being show, breeding, and fiber-producing animals. Pygoras can also be milked, producing about one liter per day. Registered Pygora goats will produce cashmere-like fleece (Classified as Type-C), a mohair-like fleece (Type-A), or a combination of the two fleeces (Type-B). Type-A fleece is composed of fibers averaging 6 or more inches in length that drape in ringlets. It may occur as a single coat, but a silky guard hair is usually present. The fibers are typically less than 28 micrometers (µm) in diameter. Type-B fleece fibers average between 3 to 6 inches in length with one, possibly two, guard hairs. The fibers are usually less than 24 µm in diameter. Type-C fleece is very fine, typically 1 to 3 inches in length and less than 18.5 µm in diameter. Pygora fiber is frequently used by fiber artists for spinning, spindling, knitting, crocheting, weaving, tapestries, and other fiber arts. It is also commonly used in clothing. 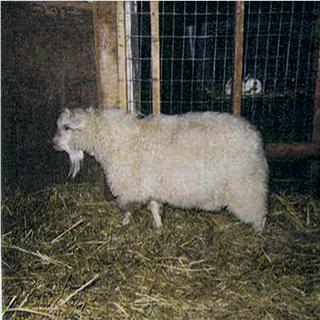 The original PCA goats were the result of several members of the Pygora Breeders Association (PBA) crossing their Pygora goats to Colored Angora Goats. Since PBA does not recognize these crosses in their PBA registry, the PCA Goat Registry was formed. It was decided to also include Pygmy goats crossed with Colored Angora Goats into the registry, since the PBA gene pool includes Pygmy. Historically, the "P" stands for the "Pygora" and the "Pygmy" in our goats; the "C" stands for "Color" and the "Cashmere" quality of our fleeces; the "A" stands for the "Angora" in our goats. The term "PCA" is now well known in the goat and fiber world and stands alone in defining our goats. What constitutes a PCA goat? Cashmere goats are easy to raise. They are healthy animals and take only minimal care. They are not jumpers like many other goat breeds and standard woven wire sheep fencing will contain them. Minimal shelter is all that is required to house them due to the insulative properties of their dual coats, which is shed for the summer. They are sheared once a year and a full grown adult buck will yield as much as 2.5 pounds of fleece. The fleece consists of two kinds of fiber, cashmere and guard hair. Average cashmere percentages are in the 20% range. The fleece can be sold to wholesale buyers or it can be dehaired and sold at retail prices to hand spinners. Cashgora Goats- Seeking Info/articles on Cashgoras. If you would like to contribute to this page please contact us. Thank you! What is a Mini-Dairy goat? A miniature dairy goat is the product of a standard sized purebred/American goat bred to a Nigerian Dwarf for the first generation of mini dairy goats. Only documented animals with traceable registrations can be used to produce a mini goat. Nigerian Dwarfs must be purebred registered with one of the ND registries. Each generation of correct miniature goats will be called an experimental until it reaches the 3rd generation where upon it may enter the American herdbook IF it meets the Breed Standards. Some people with small acreage are looking for a smaller milk producing animal for a family milk supply. Miniature dairy goats are now being allowed in some of the large cities across the country. Purebred dairy goat breeds have been pushing for greater stature for the show ring which has resulted in all of the standard dairy goat breeds getting larger in recent years. Smaller goats are easier for children, seniors and the handicapped to handle. Their smaller size makes them a lot easier to handle than their larger relatives, so hoof trimming, clipping, showing and milking become much easier. Feed costs are rising and a mini dairy goat can often produce 2/3 the amount of a standard dairy goat while often consuming 1/2 as much feed. (This will need to be proven with time.) Smaller goats are in demand for the pet market. The influence of Nigerian Dwarf blood may serve to expand the breeding season past the fall months and increase the butterfat in the milk. A miniature dairy goat is the product of an standard sized purebred/American goat bred to a Nigerian Dwarf for the first generation of mini dairy goats. Only documented animals with traceable registrations can be used to produce a mini goat. Nigerian Dwarfs must be purebred registered with ND registries. Each generation of miniature goats will be called an experimental until it reaches the third generation where it will be able to advance into the American herd book if it is correct according to the Breed Standards. A certification of purebred can be issued at the sixth generation if they conform to breed standard. How Much do Miniature Dairy Goats Milk? Miniature dairy goats have been reported to produce anywhere from 2 lbs a day (1 quart) to 10 lbs a day (one and a quarter gallons) with the average around 5-6 lbs (3 quarts) of milk daily. Genetics and management will play an important part in milk production. Unlike many of the standard breeds, Nigerian Dwarfs breed year around which this makes it easier to have a steady supply of milk all year - many of the miniature dairy goats are also year round breeders. What if I want to experiment with percentages in my breeding program? The purpose of MDGA is to provide you with an inclusive means of recording and supporting the development of miniature breeds. If you feel that it will help you better reach your goals by crossing with percentages other than 50/50, MDGA will still register your goats as Experimentals. You may still apply for the American Herdbook by the third generation provided your goat meets the standard. If at any time you breed back to a purebred Nigerian or a standard dairy goat, the offspring will revert back to first generation. If you experiment with percentages other than 50/50, it may take more generations to attain purebred status, but in some cases it may be worth it in your breeding program. How tall will the Miniature Dairy Breeds be? The Mini-Dairy goats are between the sizes of the Nigerian Dwarf and the standard breed. Measured at the withers, the preferred maximum height for does is twenty eight inches (28") and for bucks twenty-nine inches (29") for all breeds. The minimum height is twenty-two inches (22") for does and twenty-four inches (24"Ã‚Â) for bucks. The preferred height is a recommendation for breeders to strive for, but will not be considered a disqualification in the show ring. But will be used as a fault in determining the placings. Website Copyright ©2007-2014 ANGBA; All Rights Reserved. Please contact ANGBA for permission to use any Assoc. content found on this site. Thank you!